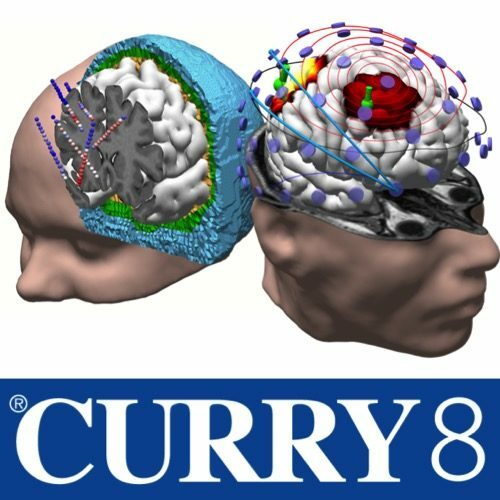 The CURRY 8 Signal Processing Package provides all the tools for processing your EEG, MEG data. After re-referencing, baseline correction, filtering, artifact detection and rejection, noise estimation, and selective averaging, CURRY can perform principal (PCA, SVD) or Independent Component Analyses (ICA) to visualize the spatio-temporal features of EEG and MEG data. A full suite of event editing and detection tools is available. Template matching and threshold based event detection. Artifact reduction by subtraction and projection of averaged artifacts. Maps (equipotential contour lines), Source Current Density (Laplacians) and sensor coherences can be computed. Frequency domain analyses (FFT, Short Time FFT, Wavelets) are also possible. CURRY uses a database structure that allows for optimized data management. Within the database, subjects can inherit the parent’s parameters, allowing automated processing to be built in to the database. Additionally, CURRY Macros can be developed to handle virtually any processing task, complete with the ability to design interactive and tutorial programs.